A book by Chip Fletcher, Associate Dean for Academic Affairs and Professor, School of Ocean and Earth Science and Technology (SOEST); Robynne Boyd; William J. Neal, Professor Emeritus of Geology, Grand Valley State University; Virginia Tice. Publisher: University of Hawaii Press (UH Press). 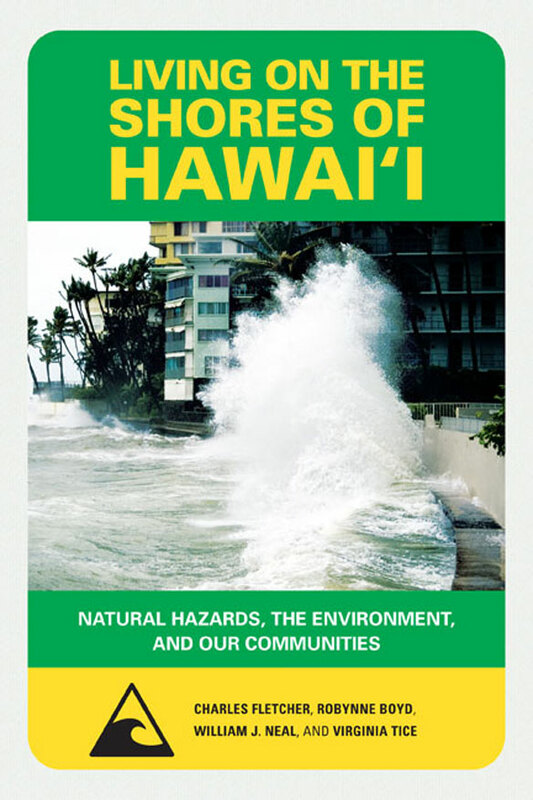 Living on the shores of Hawaii: natural hazards, the environment, and our communities addresses a wide range of environmental concerns within the context of sustainability and their influence on the future of Hawaii. It traces land-use practices before and after the arrival of Westerners and the increased tempo of destruction following the latter. It also discusses volcanoes and the risk of placing homes in locations vulnerable to natural hazards and the potential dangers of earthquakes and tsunamis to a complacent public. Water issues, including scarcity, flooding, and pollution, are surveyed, as well as climate change and the possible outcomes of projected sea rise for Hawaii. It then explains coastal erosion and beach loss and the problems of overfishing and ocean acidification. Later chapters assess residents’ risks to hurricanes, offering mitigation techniques, and provide a summary and some management conclusions.